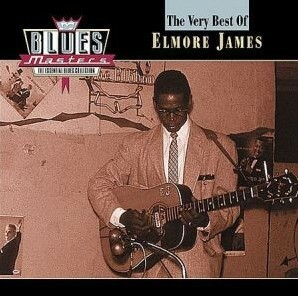 Elmore James was born Elmore Brooks in Richland, Holmes County, Mississippi, the illegitimate son of 15-year-old Leola Brooks, a field hand. His father was probably Joe Willie "Frost" James, who moved in with Leola, and so Elmore took his name. Elmore began making music at the age of 12 using a simple one-string instrument ("diddley bow" or "jitterbug") strung up on a shack wall. As a teen he was playing at local dances under the names Cleanhead and Joe Willie James. His first marriage, circa 1942, was to Minnie Mae. He subsequently married at least twice more. 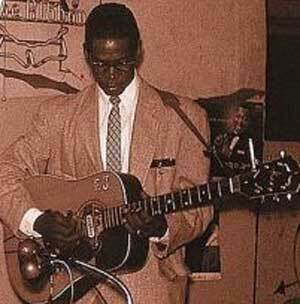 James was strongly influenced by Robert Johnson, as well as by Kokomo Arnold and Tampa Red. 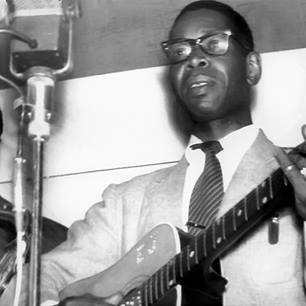 Elmore James recorded several of Tampa's songs, and even inherited from his band two of his famous "Broomdusters" band, "Little" Johnny Jones (piano) and Odie Payne (drums). There is a dispute as to whether Robert Johnson or Elmore James wrote James' trademark song, "Dust My Broom". Born January 27, 1918, in Richland, Mississippi, Elmore James was raised on several different farms in the Durant, Mississippi, area by sharecropping parents. Before acquiring his first guitar, he played several different homemade instruments, including a strand of broomwire nailed to the front porch of his cabin. This was known locally as a "diddley bow." 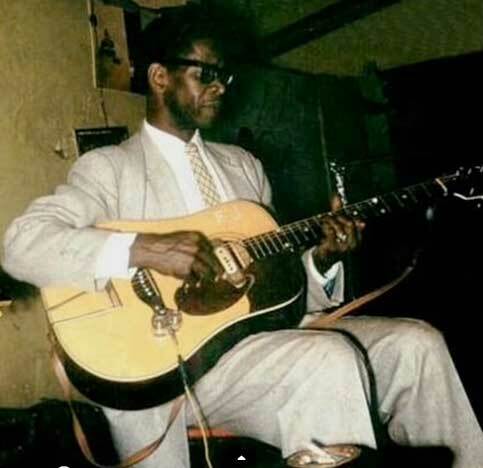 In 1932, at the age of fourteen, Elmore James, also known as Joe Willie, began playing guitar for parties and dances in the Durant area. By 1937 James had moved on to plantations near the Delta town of Belzoni, Mississippi, and taken up with musicians Sonny Boy Williamson and Robert Johnson. Johnson's guitar prowess made a terrific impact on James, who would echo Johnson's slide technique in his own recordings. After Johnson's death, James toured the South with Williamson working juke joints and theaters. He assembled a band in 1939 after parting ways with Williamson. During the late 1930s or early 1940s James began playing electric guitar. He became a master of using the distortion and sustain of this instrument to create a dense, textured sound that provided the blueprint for postwar Chicago blues. James was inducted into the Navy in 1943, taking part in the invasion of Guam before being mustered out in 1945. He was soon back home in Belzoni, sharing a room with Sonny Boy Williamson and working the local jukes. James also began a professional partnership with his guitar-playing cousin "Homesick" James Williamson, working clubs on Beale Street in Memphis. In 1947, James backed up Sonny Boy on KFFA radio's King Biscuit Time program in Helena, Arkansas. The show was initially broadcast from the Interstate Grocery Building before it moved to the Floyd Truck Lines Building. During his stint on KFFA, James fell under the spell of Robert Nighthawk, refining his style to reflect Nighthawk's liquid, crying slide guitar. While working clubs with Williamson in Jackson, Mississippi, James made his first record for Lillian McMurry's Trumpet Label. On August 5, 1951, at the Trumpet Studios, James cut the Robert Johnson chestnut "Dust My Broom" which reached number nine on the national R&B charts within several months of its release. James established residency in Chicago the following year, forming his legendary band the Broomdusters. While never attaining the fame of fellow Mississippi expatriates Muddy Waters and Howlin' Wolf, James became one of the city's most influential guitarists. He recorded for a variety of labels throughout the 1950s and early 1960s, leaving a legacy of slow blues, boogies, and full-fledged rave ups that dominate the musical vocabulary of Chicago blues. 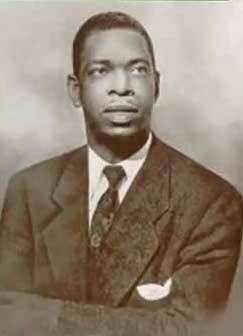 Elmore James died May 24, 1963, in Chicago, Illinois, at the age of forty-five. 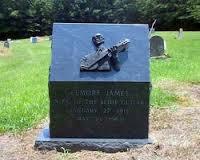 Elmore James's grave is located near his native Durant, Mississippi. Elmore James's grave in the Newport Community Cemetery, behind the Newport Missionary Baptist Church near Ebenezer, Mississippi.